There’s a season for everything. If you’ve been following me, you know that I indulge in mainly poultry (chicken/turkey) and seafood. However, once in a while, I deviate and like to enjoy a good pork dish, piece of steak or any other protein. I believe in a fine balance. This afternoon I decided to go that ‘meaty’ route. Moreover, today is a perfect day for same as I wanted a dish to warm my stomach and comfort me during this extremely windy, wet and cool day here in Florida. My choice of protein was a beef rib dish. Decided to braise same and infused fresh ginger and balsamic vinegar. I made sure to remove extra remnants of fatty tissue and season with pinch of salt, black pepper, crushed garlic, balsamic vinegar, soy sauce and crushed ginger root. 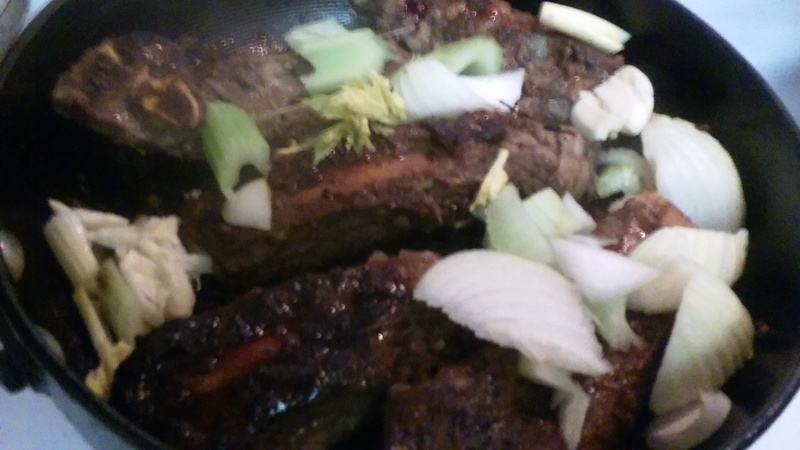 Ribs were browned in a sturdy skillet with a drizzle of canola oil under medium to high heat. And, then roughly chopped celery, onions, extra garlic, fresh thyme and crushed pimento (all spices) were added. Cold tap water was then added to cover ingredients. With lid on under low to medium heat, ribs slowly simmered to a fork-tender finish for approximately two and half hours. In between cooking process, water was added when evaporated. Also, other ingredients like a pinch of brown sugar, spices and chopped scallion were added. The ribs produced a delicious brown gravy that tasted very succulent. Moreover, the ginger root was not overpowering; but, blended well with all the other ingredients. 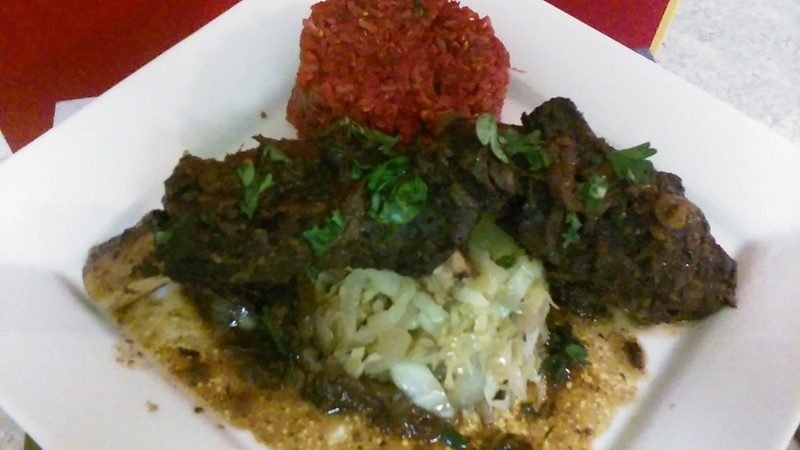 I served same with a beet root/carrot steamed rice with a few dried cranberries along with sauteed cabbage. Ribs were garnished with fresh parsley.